Assam State Disaster Management Authority. 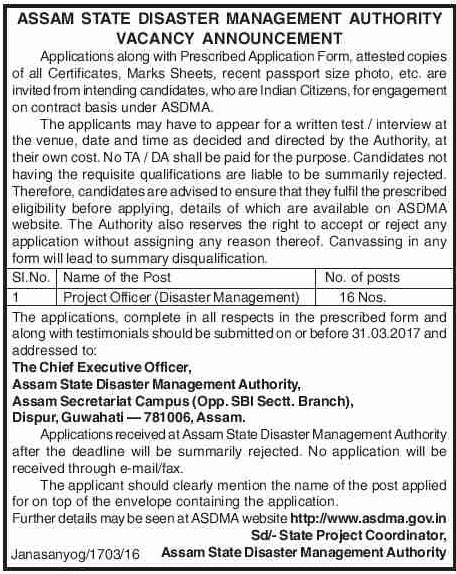 Assam State Disaster Management Authority has issued an employment notification for the recruitment of 16 nos of Project Officer post. Age : Candidates should not be below years and above years on 01-01-2017. Educational Qualification: Graduate degree in any discipline from a recognized University or institute or equivalent. Preference will be given to the candidates with Diploma/ Degree in Disaster Management. Experience: Minimum years working experience as a full time paid employee in an organization of repute dealing with Disaster Management. Dispur, Guwahati — 781006, Assam.